Yakawonis Quilling - Posters Giveaway! Congratulations to krosenthal212, the giveaway winner! November has been quite the month around here! Each Wednesday a new giveaway has launched and today is no exception. Sarah Yakawonis of Etsy shop Yakawonis Quilling, whose unique paper art you might recall from past features, contacted me about offering two printed posters to a winner anywhere in the world. 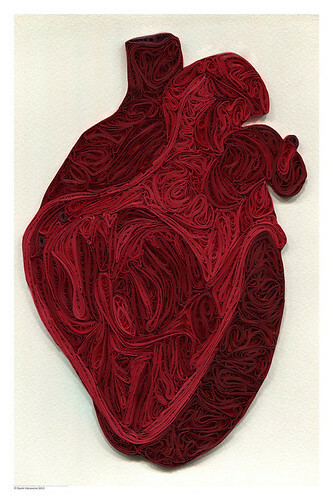 She combines graphic design skill with the timeless art of quilling, resulting in an appealing effect. Pop culture - movies, music, tv shows - all are fair game. 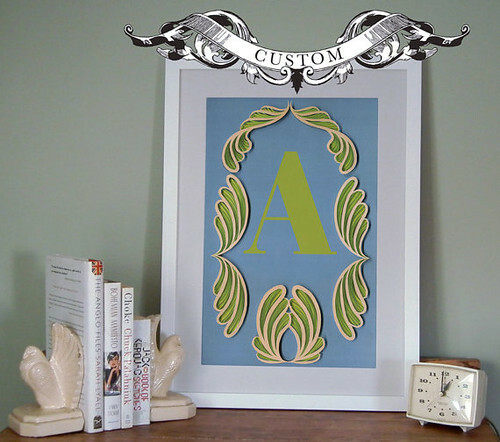 Quotes, monograms, and fine art are in the mix too. You'll even find tree ornaments and print-on-demand pillows, iPhone cases, and Samsung Galaxy cases that feature Sarah's art. She has developed a photographic method that captures the dimensionality of on-edge paper quilling and mentions that people have touched her posters and prints to see if they are truly flat! 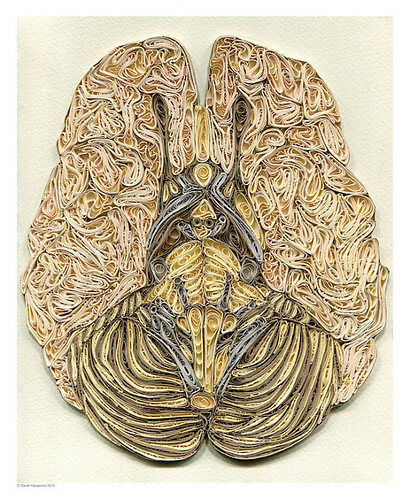 Sarah's quilled anatomical illustrations have received a great deal of attention, taking her as far as one can go across the United States. Sarah lives in Maine and was a featured speaker last autumn at the Anchorage Museum in Alaska as part of their Body Worlds Vital exhibit. The acid-free posters are printed on 100 lb. cover weight Accent Opaque brand paper and measure 12 x 18 inches (30.48 x 45.72cm). This next one is a timely piece since tomorrow night may be when we'll finally get to see the ISON comet. "This poster features a comet with its tail of carbon dioxide and dust as it melts due to the sun’s heat. It was inspired by my excitement over the ISON comet expected to be seen in November 2013!!! 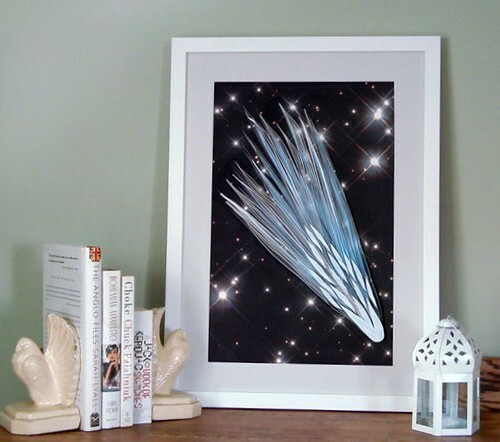 It was created by combining my hand drawn comet with a paper quilling tail, all on a black and starry photo provided by NASA's Hubble space telescope." New to Sarah's product line are custom wedding keepsakes and monograms, along with custom portraits that she creates as etched-style illustrations. To recap, leave a comment as your entry to win two posters (total value $40) from the Posters section of Yakawonis Quilling. (custom prints are not included) The winner may choose two of the same poster or two different posters. Perhaps one for yourself and another to put under the tree. This is a worldwide giveaway; it wraps up at the end of Sunday, December 1. The winner will be drawn at random and notified via email so please be sure to include a way to be contacted within your comment. As tomorrow is Thanksgiving here in the U.S. I wish all of you, no matter where you happen to live on this fine earth, a wonderful day. Thank you ever so much for sharing my enthusiasm for paper and for reading along here on the blog! simply stunning - thanks for the opportunity - I think they'd be very inspirational hanging in the studio! Wonderful! As I love all things paper, I'd love to win two of these! Who knew penguins were could be quilled. 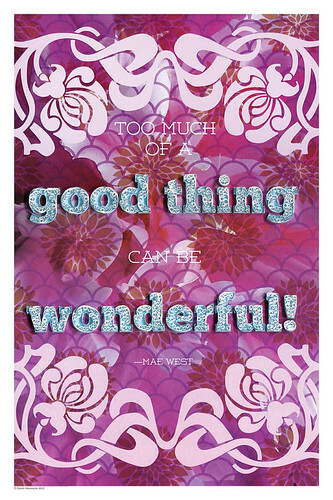 I love the quilled quote posters. It makes the letters really pop! These are absolutely amazing! I love the brain and heart! Lovely posters. It's hard to choose just two from such a lovely bunch, but the comet and the molecules of happiness would be my top picks. Thanks for the chance ! Awesome work! I would love to win a couple. Thanks for the chance. Such amazing work!!! I LOVE that comet!! Very inspiring. all stunning! I love the heart! Happy thanksgiving Ann !! I am a fan of Yakawonis !! Wow! Such amazing art! Thanks so much for a chance to win. I am awestruck. What absolutely fantastic work, I would love to own one. Thanks for the chance. 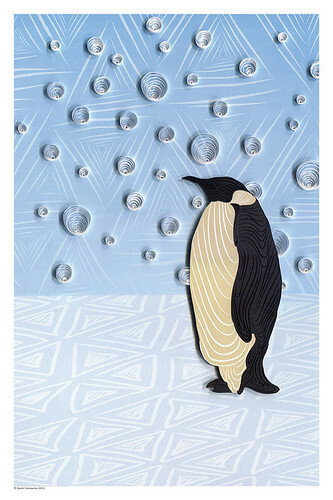 I like the Penguin paper art print. The glass ornaments are neat too. I love Sarah's work . Awesome, unique work. 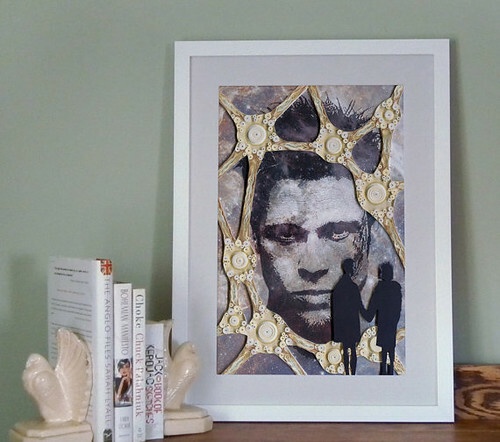 The Pulp Fiction print would be perfect for my new apartment. My bf and I both love the movie. krosenthal212 at gmail dot com. These are so amazing! I love the variety. Thank you so much for sharing them. Such beautiful work, that comet piece in particular, and the penguin! Getting up early for some comet viewing over the next week or so, so very apt. Thanks for the chance! i love this site!!! i would love to have a poster! I love the comet poster! It would look great hanging in my classroom (I'm starting to build up a great collection of science-related prints & posters and I'll be setting up a gallery wall soon!). I love how easy it is to make something basic with quilling, but I also love how it can be taken to a whole new level. It's inspiring! Wow!! So much talent. I love quilling. Thank you for the chance to win something so beautiful. I love her work, I have a link to her blog myself that I love to visit. This is a great opportunity. This giveaway has ended. Thanks to all who entered! Mind blown by the anatomical pieces. I hope to one day have time to take my work in an interesting direction like that.